The Beijing art gallery Ink Studio is delighted to announce its third exhibition: The Origins of Abstraction: Wang Dongling's Abstract Ink Painting and Photographic Calligraphy. Director of the Modern Calligraphy Study Center at the China National Academy of Fine Arts, Wang Dongling is widely regarded as one of China's greatest living calligraphers, belonging to a lineage of twentieth century masters including Lin Sanzhi 林散之 (1898-1989), Lu Weizhao 陆维钊 (1899-1980), and Sha Menghai 沙孟海 (1900-1992). His artistic practice embraces the traditional calligraphy for which he is best known, as well as highly experimental works including abstract painting based on calligraphic gesture, performance art that brings calligraphy into site-specific contexts, and camera-less photography that captures calligraphic actions on photographic paper. For Ink Studio's Origins of Abstraction exhibition, Wang Dongling has created a special body of work that demonstrates the power of the artist's revolutionary redirection of traditional calligraphy techniques into "modern calligraphy" and line-based abstraction. The exhibition will include a rare, extremely large abstract work by the artist, as well as a modern calligraphy series rendered in a new medium, brushwork on photographic paper. During the 20th century Chinese calligraphy and its relation to abstraction established a nexus through which Chinese and Western art have been able to exchange and borrow from one another. While Chinese art of the last century was influenced deeply by Western culture, calligraphy maintained its cultural purity. Instead of receiving influence, calligraphy helped shape the development of the American Abstract Expressionist and European Art Informel movements of the 1940s and 50s, touching the thinking of such noted artists as Mark Tobey (1890-1976), Isamu Noguchi (1904-1988), David Smith (1906-1965), Franz Kline (1910-1962), Jackson Pollock (1912-1956), Robert Motherwell (1915-1991) and Antoni Tàpies (1923-2012). Over the last two decades Western Abstract Expressionism has, in turn, flavored the practice of modern Chinese calligraphy — the work of Wang Dongling being the most significant example of this latest exchange. Wang Dongling's innovations notably reinterpret for a new era two aspects of historical calligraphy practice — its creation through performance and its embrace of gestural abstraction. In his performances writing monument-scale calligraphy or abstraction, he lays bare to the public the connection between brush-and-ink and the body; he exposes the work of art as shaped directly by the artist's reach, stamina, and physical movement. In his calligraphic abstractions, Wang liberates calligraphic gesture, form and space from the bounds of text, not unlike music that is pure sound free from narrative or song. The history of non-objective painting in twentieth-century Modernism and Minimalism is rife with references to calligraphy and its early embrace of gestural expression. Through Wang's nativeexploration of this fundamental link, the influence of calligraphy on contemporary abstraction comes full circle. Wang Dongling's abstract ink paintings have been called "abstract art," "calligraphic paintings" and "calligraphic abstractions." In these works, he acknowledges a common ground with Western abstraction in the shared human instinct for "graffiti." However, having trained himself daily for a half century in the use of the Chinese brush, the strength of Wang Dongling's line-work is unlike that of modern Western Abstract Expressionist painters. More importantly, the execution of calligraphy proceeds from empty space such that the brush in motion carves the entire form and relationship of space in one continuous improvisational expression. The calligraphic aspect of Wang Dongling's abstractions thus lies in his performative embodiment of expression in the form of lines; "Musicians rely on sound to reveal the tremendous power of the mind; the painter uses colors and surfaces as forms to explore the spirit and the endless movement between the spiritual and the material, while the poet relies on text as signifiers and latent signifiers to address his unending interrogations and lamentations to the world. Calligraphers also convey something intangible through the movement and rhythm of their lines as they cannot use semantics to convey spiritual strength. Art is speech, and the speech of brushed lines is a unique type of speech." For Wang Dongling, traditional calligraphy has as its premise training in writing and it relies on a spirit of relaxation and peace of mind; calligraphic abstraction, by contrast, requires searching, exploration, and excavation. While calligraphy is an act of writing, calligraphic painting is a process of effecting creation — of precipitating a form that embodies the freedom of an artist in action. In his pursuit of modern forms for calligraphic expression, Wang Dongling experiments with the wide range of expressive means made possible by contemporary art practice. One recent innovation involves camera-less photography or photograms, a photo-chemical technique pioneered by the American modernist Man Ray (1890-1976) and Bauhaus constructivist László Moholy-Nagy (1895-1946). Through this technique Wang Dongling explores the qualities of the calligraphic brush in reverse. The calligraphy negative created by writing with the brush on photographic paper is evocative of ink rubbings made from written inscriptions on bronze vessels, carved stone stele or stone-cut reproductions of famous calligraphic models. Unlike such traditional ink rubbings, however, Wang Dongling's photo-negative process highlights the quality of brush texture, the nuance of "ink" tone and the crucial role of negative space both within the brushstroke and without. This technique deftly captures the sometimes delicate, sometimes explosive balance and energy within the form and offers the contemporary viewer a completely new way of experiencing the expressive power of the artist's brush. 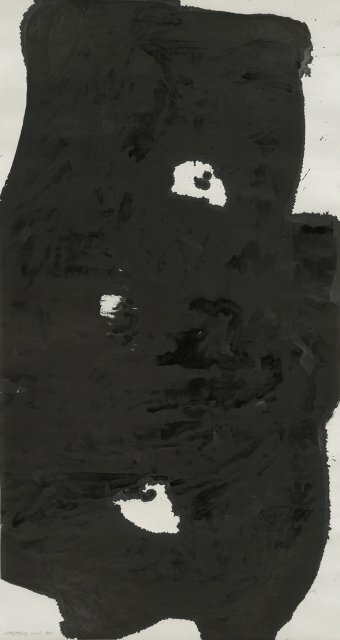 Wang Dongling's work has been collected and exhibited by The Metropolitan Museum of Art, The Solomon R. Guggenheim Museum, The British Museum, The National Art Museum of China, The Military Museum of China, Peking Library of China, Harvard University, Yale University, Stanford University, University of California, Berkeley, Schleswig-Holstein Art Academy and Peking University. Ink Studio is responding to new developments in the media of ink painting currently emanating from China. In its upcoming exhibitions program Ink Studio will seek to demonstrate how a group of important artists have, over the past decades, been highly active in researching and developing the immense contemporary creative possibilities of the Chinese painting tradition of paper and ink. These artists' work is increasingly attracting serious international critical attention. Ink Studio's mission is to present the best of this new work to the public in a closely curated exhibition program supported by indepth critical analysis, scholarly exchange and bi-lingual publishing in Chinese and English.